Friars Fintan O’Shea and Dominic Hession celebrated their Golden Jubilee of Ordination at the Franciscan Friary in Merchants Quay, Dublin recently. 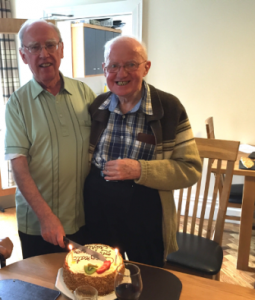 Frs Fintan and Dominic grateful for 50 Years of Blessings! Fr Fintan, from Killarney, County Kerry, has ministered in Latin America and Ireland throughout the past 50 years. Fr Dominic, a Dublin man, has worked in South Africa all his priestly life, and will return there after his holiday in Ireland. May they Lord continue to bless their lives and ministries.